Beginning at the Guion Farm area of DuPont State Forest on Sky Valley Road you can make a nice hike on several roads that loop through a deep and dense pine woodland. This is a pine regrowth region that the N.C. Forest Service leases for controlled logging, so you may need to keep your eye out for large trucks, but you may also have the opportunity to see modern lumberjacks in action. Half way along the loop through the forest is a 19th century cemetery that encloses the remains of the Thomas family. Dave, Grace and I walked these roads on Friday, December 11, 2015 from 10:30AM to 12:45PM. Our plan was to take Hickory Mountain Road from Guion Farm to White Pine Road, then to Buck Forest Road and Thomas Cemetery Road, finally returning on Tarklin Branch Road. Hike Rating: Easy. This is a mostly flat hike, but nearly 6 miles in length. Trail Condition: Excellent. This loop is all forest service roads, so no worries about roots or rocks or creek crossings. Starting Point: Guion Farm parking on Sky Valley Road. Trail Traffic: We did not encounter any other hikers, but we met a very large logging truck, a half dozen mountain bikers and a couple of equestrians. Keep your eye out. How to Get There: DuPont State Forest can be accessed from Hendersonville, NC via Kanuga/Crab Creek Rd., from Asheville/Brevard via US64 and Little River Rd., or from Greenville, SC via Cedar Mountain and Cascade Lake Rd. Sky Valley Road is in the northeast corner of the forest. Look for printed trail maps at public parking areas. The mission of the North Carolina Forest Service is to protect, manage and promote forest resources for the citizens of North Carolina. Included among the goals is occasional harvesting and restoration on state forest land, especially among pine forests. Some of that pruning has been ongoing along Thomas Cemetery Road in DuPont State Forest. 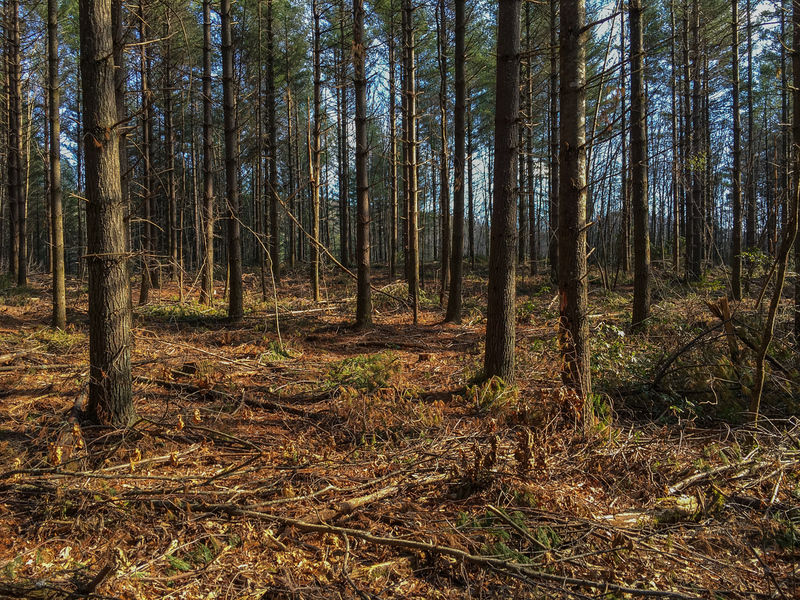 The specific goal is to transform 85 acres of a white pine plantation into a mixed hardwood forest. Timber from the restoration work will be salvaged and sold, and proceeds will fund projects in DuPont Forest geared toward public safety and maintenance of existing infrastructure. So, as you hike these roads described here, you may think how sad it is that they’re harvesting portions of the beautiful forest. But there is a method to the management, and in the long term it benefits both the forest and the Forest. In the meantime, you can observe the logging actually taking place. Just be sure to stay a safe distance away, and obey any temporary road closure signs. The logging is performed with a forwarder, a piece of equipment that minimizes soil disturbance and need for new roads. This particular hike starts out at the Guion Farms parking area along Sky Valley Road. In the northwest corner of the large gravel parking lot is the trailhead for Hickory Mountain Road, heading toward Guion Farm itself. The first couple hundred yards are across a large field, then the road enters the pine forest. After roughly one third of a mile take a left turn on the aptly named White Pine Road. If you’re like me, you will love the orangish-red color of the pine straw that covers the pathway. It also makes for a nice, cushiony tread for hiking. The white pines stand tall here, towering high above. White Pine Road is one half mile in length, and ends at a junction with Thomas Cemetery and Buck Forest Roads. On the day Dave and I were there this northern end of Thomas Cemetery Road was closed for active logging, so we turned right onto Buck Forest Road with the hope that the south end of Thomas Cemetery Road would be open. Turns out the plan worked. After a mile on Buck Forest Road, when we reached the other end of Thom. Cem. Rd., there were no signs posted. We turned left here. This direction also works out for quick access to the Thomas Cemetery itself. Just a couple hundred yards away on the right, the small family cemetery is surrounded by split rail fence. The tombstones indicate the resting place of the parents, and quite a large family of children. The stones on the children’s graves are all marked with their initials. The parents lived in the 19th century, and their marker is the only one with names and dates. After passing the cemetery, we entered the central pine plantation and evidence of the recent logging on both sides of the road. It doesn’t look too bad. Obviously not clear cut, the pines have instead been thinned, leaving plenty of healthy trees to mix with the eventual hardwood growth. The aroma of pine fills the air and is magnificent. About a half mile past the cemetery we reached the junction with Tarklin Branch Road and turned right onto it. Soon after, there is an option to go to Wintergreen Falls. Since we had been there recently we chose to pass on that and instead continue straight on Tarklin Branch for the final mile back to the parking area. Our day wasn’t quite finished though. I was curious about the kid’s bike path on the west end of the parking lot, so we walked around and found a spot for lunch. See the tiny loop in the GPS track map above. This bike path is a very nice feature of the state forest, offering a miniaturized version of a fancy mountain bike track. There are bike jumps and teeter-totters, as well as raised and curved wooden tracks, all located within the midst of a stunning pine forest. Well done! Returning to our vehicles after the circuit, we ran into three well known WNC hiking aficionados including Rich Stevenson, Brenda Wiley and Emily Felty. It’s always exciting to see others who share your same love of the beautiful WNC wild places. To summarize, this nearly six mile loop is great for exercise, and a relaxing stroll through a remarkable pine forest that will fill all your senses. Bring your dawg along to share the beauty like we did, and it’s even ok if you ask gramma and grampa to join too. If you pack the kids with you, also be sure to bring their bikes so they can enjoy the bike trail built just for them.